home » news » jewelry for leap year! We hope the year has started off well for you! I carved out a little time to make some new jewelry, despite being very busy with other things (as usual). This time we have a small selection of African tribal necklaces in some brighter colors for spring and some additions to our sterling silver floral motif. The faceted gemstone lotus flower now adorns a larger version of the hair slide that we sell on Etsy. We hope these fulfill the requests we’ve received for more dramatic and sparkling hair ornaments! 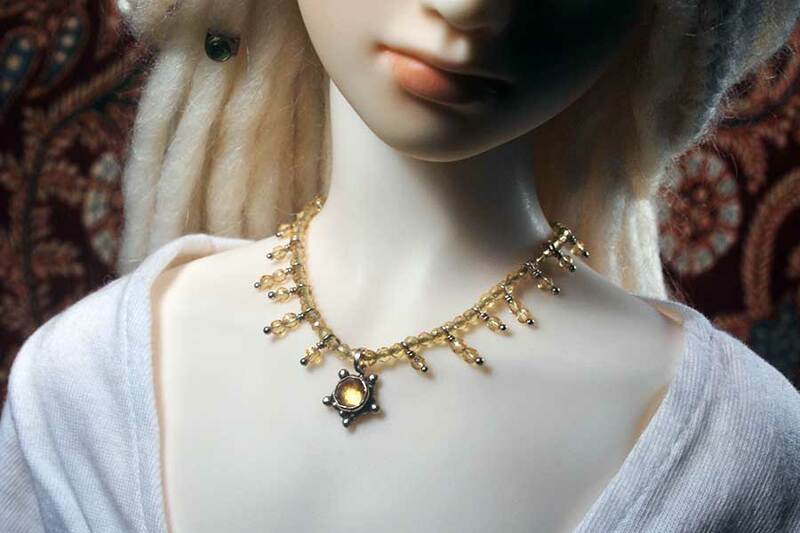 Also in the dramatic and sparkly category is a unique necklace using a myriad of tiny faceted citrine beads that have been waiting to become something fabulous for a long time. The floral motif has carried over to two unique rings up for offer this time, both in shades of blue. We are particularly excited about the first appearance of Kingman turquoise from Arizona in this release and we look forward to using more cabochons from the little stash we recently acquired. The stones are irregular shapes and require more work to create bezel settings for them, but their color and personality make them well worth the time. Current auctions end on March 7th.